DAVID LE/Staff photo. 5/12/15. Danvers High School seniors that were nominated as the Top Scholars on the North Shore include: Raquel Leslie, Patrick Berry, Jenna Glazier, Eden Hammerle, Rebecca Hardenstine, James Hopkins, Payton Johnson, Sean Lundergan, Haley O'Shea, Matthew Olszak, Carly Tarricone, Maria Tenaglia, John Tibbetts, Jason Trefry, and Jacquelyn Veatch. 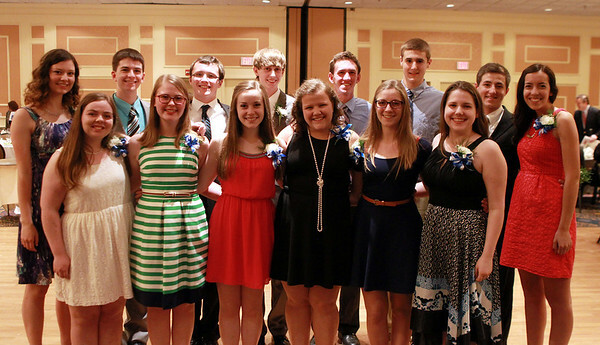 at the 47th annual Honor Scholors Recognition Dinner held at the DoubleTree in Danvers on Tuesday evening.